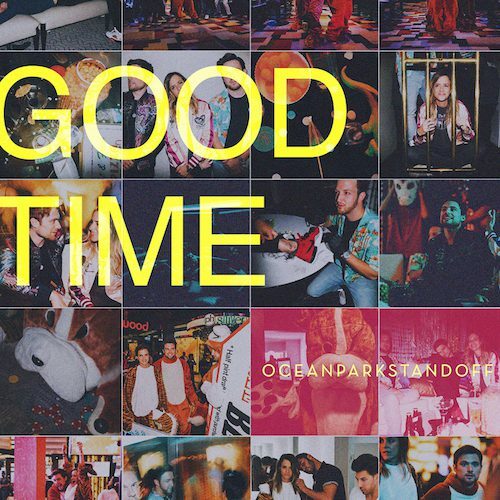 OCEAN PARK STANDOFF RELEASES NEW SINGLE “GOOD TIME” TODAY! 8 February 2019 (Toronto, ON) – Recording artist, Ocean Park Standoff releases their new single, “Good Time,” today on all digital retailers via Hollywood Records/Universal Music Canada, the country’s leading music company. The single, a college worthy party anthem, was written by Samantha Ronson, Ethan Thompson, Pete Nappi, and Nolan Sipe and produced by Pete Nappi. To coincide with their single release, Ocean Park Standoff posted a memoji video for “Good Time” onto their YouTube channel today. Watch the video here! When members of a band come from disparate backgrounds, each member’s idiosyncrasies and individuality come together to form a new collective identity. That certainly has been the case for Ocean Park Standoff since forming in late 2014. For as different as Pete Nappi (producer, drummer, hip-hop head and Long Island native), Samantha Ronson (UK-born multi-instrumentalist, lyricist, and internationally renowned DJ) and Ethan Thompson (multi-instrumentalist, classically trained vocalist and singer-songwriter - hailing from Montana) might seem at first glance, they quickly turned Ocean Park Standoff into a an amalgamation of artistry and vision giving OPS its creative energy and identity; a trio from different worlds colliding to create aggressively uplifting, alternative leaning, hip-hop influenced party anthems. Within a year, Ocean Park Standoff’s music and message made a major splash. Their self-titled debut EP was powered by the breakout single “Good News,” (currently at 21+M streams and counting). They ignited late-night television for the first time on The Late Late Show with James Corden. Between headlining numerous dates, they supported Third Eye Blind and Silversun Pickups on a 2017 summer shed tour followed by a spring tour with AJR and wrapping up 2018 with a North American run supporting Dublin’s alternative rock band Kodaline. Along the way, they constantly wrote and recorded new music for a string of singles. The follow up single “If You Were Mine” [feat. Lil Yachty] illuminates their progression. Perfecting a signature fusion of neon synths, shimmering electronics, propulsive handclaps, and acoustic guitars, it quickly slips into a chantable refrain before Yachty serves up an auto-tuned cameo. The lyrics prove provocative, passionate, and powerful. Ocean Park Standoff will keep up the momentum with a bevy of new music throughout 2019 and beyond.